Can you imagine the joy of seeing a story that you’ve created and told countless times to your children being put into print, with the loveliest illustrations? 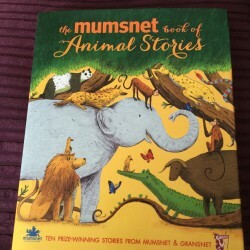 The hardback book above is as a result of a Mumsnet, Gransnet and Walkers Books collaboration to find ten winning entries for inclusion in a book about animal stories, created by parents, for parents. Last year’s competition resulted in a wonderful book of bedtime stories. We were very fortunate to be sent a copy of the book – it’s always very exciting to receive a book through the door – and, over the last few days, we’ve been reading it together. 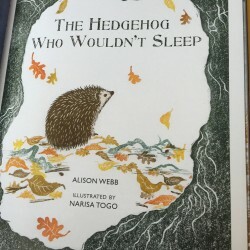 The stories are fantastically varied from a little wolf who found out it was fun to be a little bit bad after always being good; a hamster blasting into space; a little bat who discovered that he loved to fly just in time for Halloween and, our favourite, a tiny hedgehog (hoglet) who was determined to stay awake through the winter. 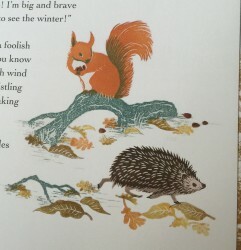 The illustrations for each story are really lovely and capture the individual tales perfectly. A beautifully illustrated treasury of charming animal stories written by members of Mumsnet and Gransnet and chosen by a panel of judges led by former Children’s Laureate, Anthony Browne. This delightful and unique treasury features ten prize-winning stories written by members of the popular parenting websites, Mumsnet and Gransnet. Chosen by a celebrity judging panel, led by former Children’s Laureate, Anthony Browne, and including Miriam González Durántez, Lucy Mangan and Justine Roberts, these are warm and witty stories, written by parents, for parents. Each of the stories is gorgeously illustrated by a talented new artist, making this the perfect gift to be treasured at bedtime. The book is priced at £12.99, click here to head to the Amazon page. It’s a book that we’ll enjoy snuggling up and reading, congratulations from us to the winning entries. Disclaimer: we received a copy of the book for the purpose of this review, all words and opinions unless stated are our own. 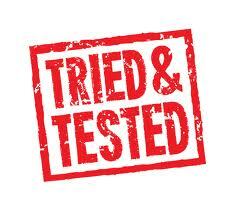 Stacey Guilliatt on 1st November 2014 at 7:28 pm. Jeannette on 2nd November 2014 at 12:02 pm. How fab, which one was it?